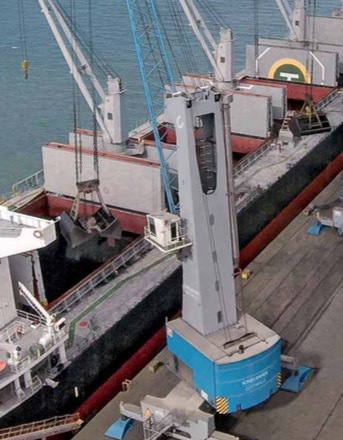 NoatumTerminal Castellon, part of the leading Spanish port operator Noatum Maritime, has added another Konecranes Gottwald mobile harbour crane to its fleet. The Model 6 machine was put into operation in May in Castellon, where it handles mainly bulk but also a number of other cargo types. The new 113,398 kg diesel- electric machine will contribute to the further growth of the terminal, situated some 80km north of Valencia. project cargo and containers. Given this variety of tasks, it was logical to opt for the particularly versatile mobile harbour crane technology from Konecranes. Moreover, since Noatum already operates seven Konecranes Gottwald mobile harbour cranes of different sizes and generations in other port terminals, this new investment proves, beyond any doubt, how we value the reliability of the machines from Konecranes." Gottwald mobile harbour crane belonging to the large crane family .The G HMK 6507 B four-rope variant for Noatum offers a maximum lifting capacity of 113,398 kg, a 45,359 kg grab curve and a maximum outreach of 51m. Konecranes is a major global group of Lifting BusinessesTM, serving a broad range of customers, including manufacturing and process industries, shipyards, ports and terminals. Konecranes provides productivity enhancing lifting solutions as well as services for lifting equipment of all makes. In 2016, group (comparable combined company) sales totalled €3,278 million. The group has 17,000 employees at 600 locations in 50 countries.